Bronze Dutch Cover Trifolium repens ?Pentaphyllum? 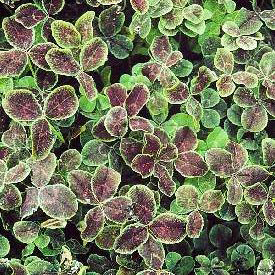 This wonderful selection of the common creeping clover makes a handsome edging or groundcover plant. Foliage is three or four-leaved, dark purple-black with a green margin. White flowers appear briefly in early summer. A very nice filler plant in tubs or mixed containers. Because of its vigorous habit, do not plant next to slow-growing alpine plants that might get smothered. Trim back hard in midsummer to rejuvenate the foliage, if plants begin to look scruffy. Easily divided in spring or fall. May be used as a lawn substitute and mowed at any time to the desired height.